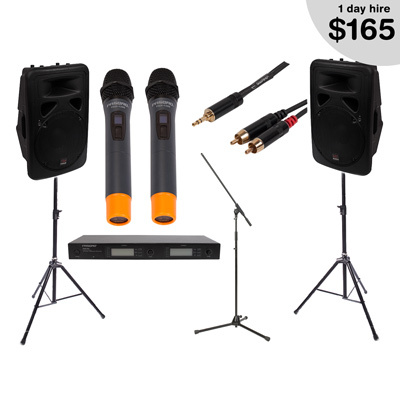 The ideal PA system for your special day. Two wireless mics allows for one to be left in position for the MC, while the other can be roving around the room. Setup is simple and instructions and a written guide are available. The 3.5mm (headphone jack) cable allows any smartphone / tablet / ipod or laptop to be connected to the system. Adjustable controls for the mic, audio input, bass and treble. For larger receptions we can supply more powerful speakers or subwoofer if desired. Suitable for up to ~120 people. Pick up available from Fyshwick, Canberra, ACT, 2609 - 9am to 5pm weekdays, 2pm Saturdays.